I am a huge fan of vintage clothes, (as can probably be seen by my blog) and undoubtedly one of the shops which has fueled this obsession is Hope and Harlequin in Brighton. I purchased my first three proper vintage garments from there nearly three years ago and haven’t stopped returning since. On the last tally between things i have bought myself there and things my Mum has bought for me I’ve spent about about £1400 in there…oh dear. The thing with Hope and Harlequin is that it is a matter of quality,every time you go in there you want to buy something, partly because the shop is so beautifully arranged and partly to do with how wonderful the stock is. Everytime you put on one of the garments in the shop you start to feel the history taking over and are transported back to when each garment was worn Yes, often it needs repairs and is falling apart, but the clothes sold there often have a history behind them and show a craftmanship of a previous age which i feel is forgotten in everything but couture these days. One of the other main reasons you can’t help but spend money is due to Louise who owns the shop, everytime i go in there she picks out items for me (which inevitably i end up buying) and she seems to know the personal story of all of her customers. She has also been incredibly helpful in terms of getting clothes altered to fit, most of the vintage i have has needed slight alterations and she has had this all sorted out for me with out a problem. So, if you are ever in Brighton head down to Sydney street and take a peek at Hope and Harlequin, you won’t be disappointed. I am just going to upload a few example of clothing i have from Hope and Harlequin for now, but i will add some more soon. 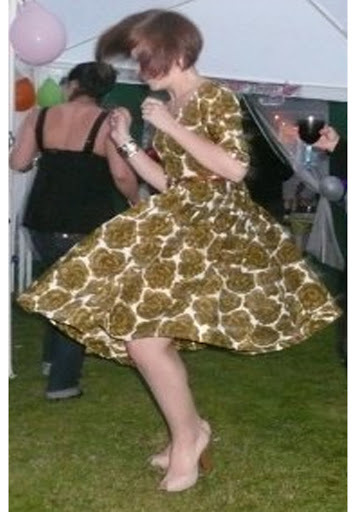 Green and white print 50’s circle dress- appears to be handmade- with original metal zip. 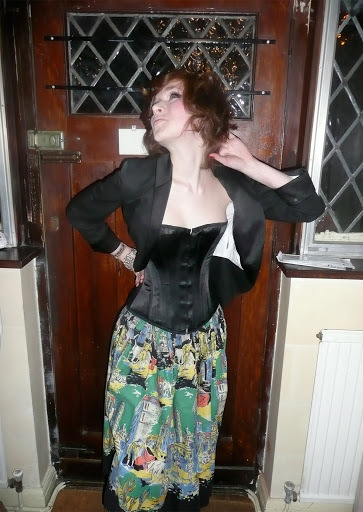 Liz, your corset at the bottom is amazing!